MEDA AC magnetic field sensors use induction coils with ferromagnetic cores to sense the magnetic field produced by alternating electric currents. The signal from the coil is preamplified with a very low noise wideband current amplifier. The coil parameters such as length, number of turns, core magnetic properties and number of winding layers are matched to the amplifier properties to optimize the overall sensitivity and noise characteristics of the sensor. The net result of MEDA's unique sensor design is a magnetic field sensor that is insensitive to the frequency of the measured field over a broad frequency range and can accurately measure very small AC magnetic fields. 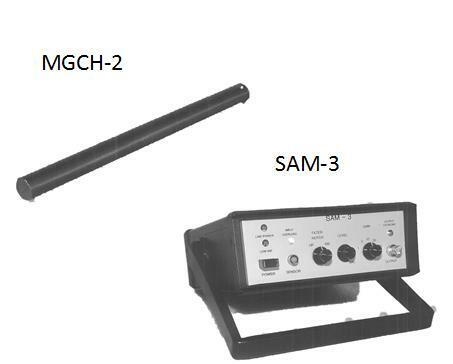 The MGCH-2 sensor covers the 10 Hz to >100 kHz frequency band. Its noise performance in the 10 kHz to 100 kHz band is superior to any other sensor on the market. Noise at 10 kHz is <10 fT/√Hz and at 100 kHz is <3 fT/√Hz.Download the Data Sheet for a complete description of the MGCH-2. The MGC-1 sensor covers the 5 Hz to 10 kHz frequency band. It has lower noise than the MGCH-2 below 100 Hz. Noise at 10 Hz is < 0.5 pT/√Hz and at 1 kHz is <20 fT/√Hz.Download the Data Sheet for a complete description of the MGC-1. The MGC-1A sensor covers the 30 Hz to >10kHz frequency band. It is the shortest of the three sensors in this bandwidth. Noise at 100 Hz is <0.4 pT/√Hz and at 1 kHz is <60 fT/√Hz.Download the Data Sheet for a complete description of the MGC-1. MEDA can also design application specific sensors to a customers physical and electrical performance requiremeents. Our SAM-3 single channel and TCM-1a three channel signal conditioners are specifically designed to power and condition these sensors. Click here for technical information on these signal conditioners. The MGCH-2 and MGC-1 require export licenses.